Are you a composer with a large music library? Do you plan to be one, someday? Perhaps you’re a producer or editor who juggles music and sound clips daily, and are throwing your hands up to the sky trying to sort your samples strewn across a half dozen hard drives. If this sounds like you, sound library management can help. I’ve managed libraries of hundreds of thousands of music tracks and sound effects. At a certain point, the advantage of having dozens of folders of clips begins to work against you. You’ll find yourself, as I had, swimming through a sea of versions, underscores, and alts. In this situation, you’ll find your work becomes entangled in file management, instead of doing what you need to: create. One way to evade this problem is to organize your collection of tracks with sound library management software, and metadata. Today’s article explains this software. It will show how you can benefit from using it, and improve the quality of your work. And, finally, it will suggest current options available for you to organize their sound library so you will work better, and faster. What is Sound Library Management Software? Sound library management software is also known by the rather dry name of “asset management” software, or music jukebox software. I call it sound browsing software. In our age of endless data accumulation, sound browsing software allows someone to increase their collection without worrying how they will find, use, or deliver the sounds they need. 1. To allow all your sound clips to be browsed, searched, and auditioned in one place. 2. To add bonus metadata to each track. 3. To convert and export these sound clips into other formats, or send to sound editing software. Each task is quite involved. Let’s look at them one at a time. More sound effects and music tracks are being created and delivered at higher resolutions. Of course, this requires more storage space. Inevitably, a composer will add many external hard drives, just to keep up. Sound browsing software keeps track of all these files, whether they are all on one drive, or many. Some software can search across networks, or the Internet. While the sounds may be in disparate places, they are all displayed together within a browser window. Tracks will stack tidily in columns, much like what you’d see in an Excel spreadsheet, or in the search results on the Shockwave Sound website. Tracks can be sorted by duration, name, file path, and so on, with a single click. This means that your main tracks on hard drive 1 will be grouped neatly with your underscores on hard drive 2. The software also allows complex searches to find exactly the tracks you need. And, when they’re displayed, your sounds can be auditioned side-by-side using non-linear scrubbing tools. The most common way of describing a sound is by its file name. Often this isn’t enough. Some of us pair this file name with more information, such as categories, composer information, and more in Word documents, or spreadsheets. The information in the Word documents is not technically attached to the file itself. The sound file and the Word document live in two different places. This means it can be separated, however, losing your valuable descriptions and data. In other words, the spreadsheet information is not part of the sound’s data itself. It’s data beyond the file, or metadata. Metadata is a way of describing a sound beyond its filename. It can involve adding information about publishing societies, instrumentation, and keywords. Unfortunately, there’s only so much of this information that can be stored in the file name text itself. Most file names are limited to 255 characters, and long file names are hard to understand. Sound browsing software fixes this problem. It writes this text data information directly into the file itself. It doesn’t damage the audio file. In fact, it will sound no differently. What the sound browsing software does is “wrap” the text information of composers, publishers, and categories around the sound file invisibly. Anyone playing the sound will not know the difference. However, when the sound is added to the browsing software, the bonus information is revealed. Bonus metadata allows you to add endless information to the files. This provides more detail to the file, allowing for richer, and more accurate searches. The best part? Once the browser software applies the metadata, it is permanently married to it. This bonus information will travel with the file wherever it goes, whether to other composers, producers, or customers. If they open the file in browser software, they’ll see the same rich, detailed data. If we look at the first two points, sound browsing software provides merely librarian services to collections. This keeps an unruly library in check, and adds bonus information for customers (or for yourself). However, once the sound is within the browsing software, creative people often need to use it beyond merely finding and auditioning libraries. 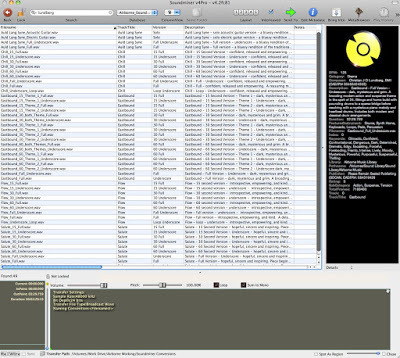 Sound browsing software allows individual clips to be used elsewhere. It has an ability to export tracks. This means it save a copy to another location, often converting it in the process to another sampling rate or bit depth. It can export brief portions instead of the entire file. And, if you are editing, browsing software can export a track right into a Pro Tools bin, and drop the segment at the edit cursor in a track. The best apps can export tracks while applying plug-in effects such as reverb, compression, and so forth, even in bulk. This makes an editor’s workflow close to seamless. It’s quite easy to search for a specific track within sound browsing software, press a button, and within a moment, edit it within your Pro Tools timeline. There are many ways to use this software. Because of this, the exact benefits depend on the projects you work on, and the method you use to create. Organize vast collections of sounds, even across many drives, networks, or the Internet. Find individual files, no matter their home location, by using complex searches, or metadata fields. Effortlessly display and sort stems, underscores, alts, and bumpers for the same track. Audition tracks, whether entire files, portions, or while previewing plug-in processing effects. Embed tracks with metadata so text information will be assigned permanently to the sound file itself. Use metadata to keep track of dozens of fields of text without worrying about accompanying text files or spreadsheets. This information will be buried within the sound itself. Batch abilities: rename files, add categories, find and replace text. Export tracks to different sampling rates and bit-depths, singly, or in batches. Transfer portions of tracks, or entire files, into editing software. Not all sound browsing software is created equal, however. They’re designed for different markets, and have prices to match. 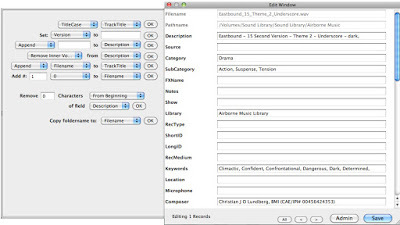 The most basic ones offer simple librarian tools: adding, searching, and auditioning tracks. As the prices increase, the ability to add metadata appears. The elite applications support higher resolutions, more channels of audio, and the ability to export to more software. Add files by “drag and drop” right from the desktop. Handle various file formats in tandem (WAV, OGG, AIFF, MP3). Keep track of multiple lists of files (e.g., music collections searched separately from sound effects). Add, preview, and export multi-channel files. Perform fast searches in immense collections. Perform complex searches across many fields (e.g., category, name, composer). Use Boolean operators for searching. Embed metadata into a file. Read existing metadata from other programs. Import or export libraries from a text file. Convert only portions of a sound file. Send a file directly into a variety of editing software. Is your editor of choice supported? Add plug-in effects to exported files (e.g., reverb, distortion, etc). Search, audition, and import files across networks, or the Web. Search remotely via a Web browser. Which of these options do you need? It depends on your workflow. Keep them in mind while browsing the software below. iTunes – A good free choice to get started. It doesn’t embed metadata (except for MP3s) or export into editing software, however. Snapper – Inexpensive, and allows importing directly into a workstation’s timeline, but doesn’t provide search, or assign metadata. Soundminer – The most feature-rich option. There are a half-dozen versions, each adding features. Soundminer began with the effects crowd but now actively adds features specifically for composers and producers. NetMix PRO – often seen as the direct competitor to SoundMiner with server, Web, and desktop options. Library Monkey – a flexible option that supports Mac OS all the way back to 10.4. The Pro option adds additional file formats. BaseHead – Also full-featured, compatible with both PC and Macs. Splat – an inexpensive option, designed with an archival slant. A simpler app. It lacks importing into other software. AudioFinder – a visually attractive option that includes support for a vast array of file formats, and plug-in formats. It has cloud-connection features. MetaDigger – a free app created by sound effects publisher Sound Ideas. It allows browsing of MP3 and BWAV metadata, and auditioning of files. It lacks importing into other apps, but makes up for it by allowing metadata editing, and exporting of text records. If you work in a creative field you know the importance of remaining inspired. The last thing you need is to be snarled in bureaucracy, administration, and paperwork. However, this is exactly the risk that occurs as sound libraries grow and technology becomes more complex. Sound browsing software will allow you to find exactly the sound you need, and get back to work. It will help you do what your clients seek from you: deliver the most creative track possible.